Hope Sri Aman and Betong is located in the state of Sarawak in East Malaysia. The church consists of people from the Dayak tribe, Iban, in these areas. 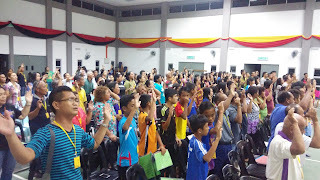 I am very grateful that Hope Sri Aman-Betong managed to organize Iban Camp at Skim Skrang Community Hall, Sarawak on 26-28 February 2016. The Camp consists of students, working adults and family groups. The theme of the camp is ‘New Life’. As there were many new members, this camp aimed to bring them a new experience of worship. God moved in this camp – the registration numbers exceeded the target, and the whole program ran smoothly. All other area leaders together with the daughter churches united in one accord to help in whatever ways they can. On the 3rd day, our Senior Pastor, Ps. Denis Lu, shared the Word of God and called for healing. Many were healed physically, emotionally and spiritually. One of the village chiefs was healed from severe hand pain. There was brother who was hit with amnesia (memory loss) and the ability to talk and walk just right before the camp. As it was not convenient for him to attend the camp, his clothes were brought instead to be prayed over. Now he is healed! Praise the Lord! I believe God’s hand will be continuously at work in Sarawak. God blesses!